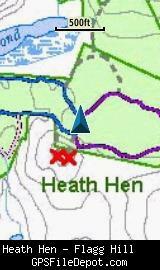 The Heath Hen Meadow Woodlands and the Flagg Hill Conservation Areas are adjacent conservation areas purchased and protected in the late 1990's. A connector trail in the southwest corner of this area leads to the Capt. Sargent Farm Conservation Area. 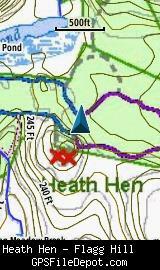 This KMZ map is set to Draw Order 32 so it will show 'beneath' the primary map on your Garmin KMZ-compatible GPS. It will also display beneath my KMZ map of the Captain Sargent Farm Conservation Area and beneath my KMZ map of Red Acre, but over my KMZ map of Marble Hill.